It’s cold, like really cold. Walking my dog early in the morning and again when I get home from work is where things get really chilly no matter how much I layer up. And where do all the dogs go in the winter? The neighborhood is full of people walking dogs in the summertime! 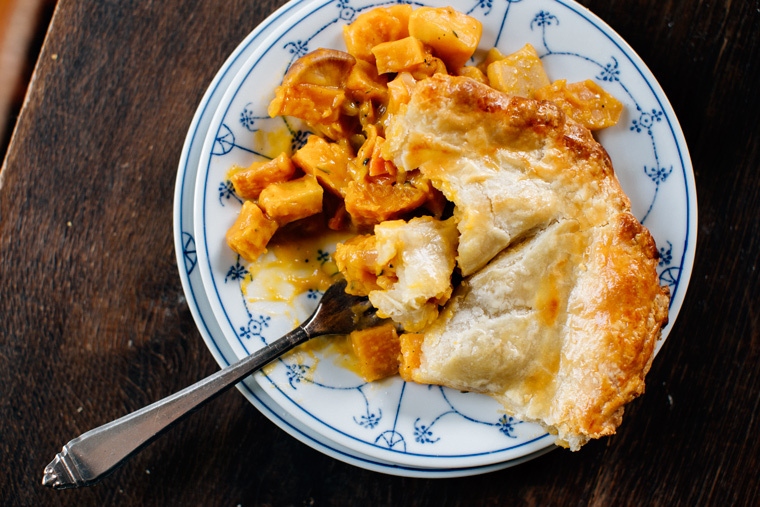 On a cold winter night nothing seems to satisfy quite like a warm, comforting pot pie. 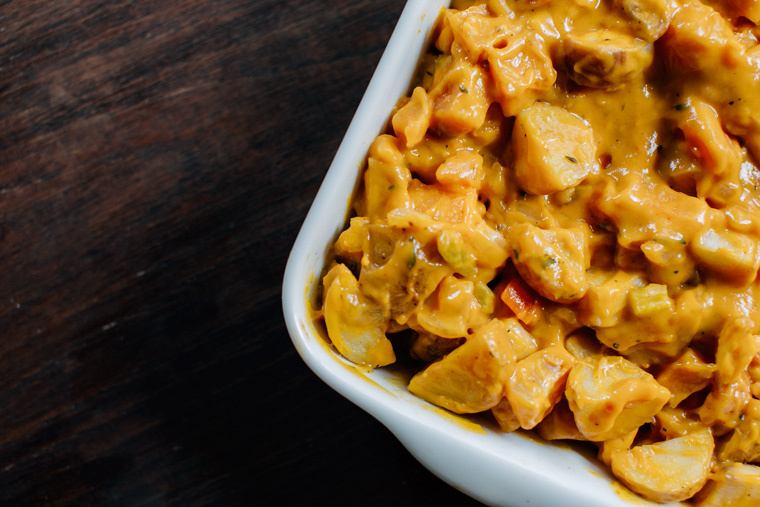 A medley of roasted root vegetables makes for a super hearty and delicious filling. I’ve found the bigger and uglier the rutabaga, the better. 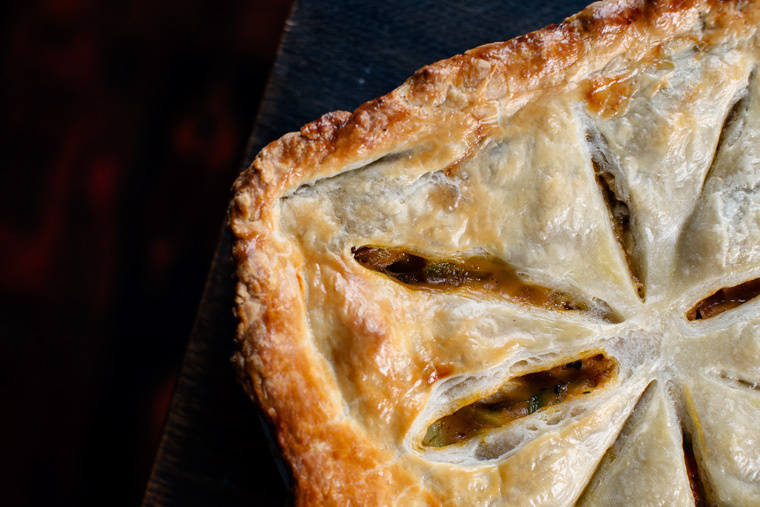 The flakey, golden crust transforms the rustic veggies into a simply elegant meal the whole family will love. You could easily make this recipe in stages ahead of time so that all you have to do is pop it in the oven when you’re ready. A simple side salad is the perfect accompaniment. 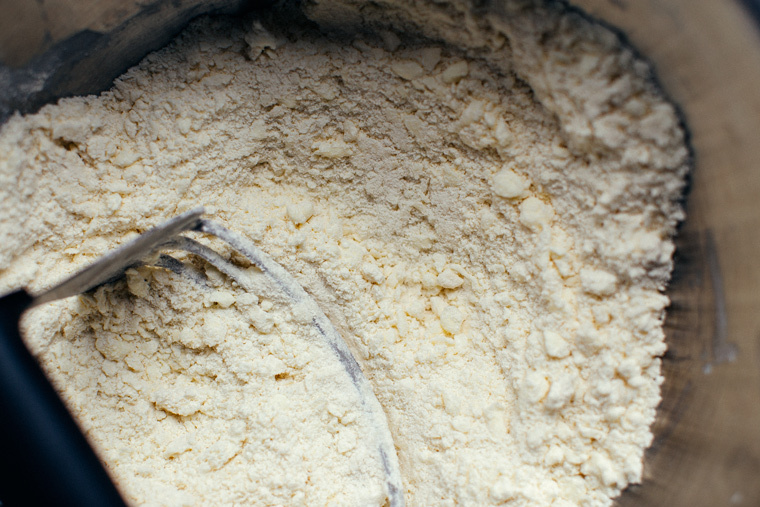 Whisk the salt and flour together in a bowl. Cut the butter into the flour to create a small pebble-like texture – you can use a pastry cutter or your fingers to achieve this. In a cup or bowl, mix together the sour cream, vinegar and water. 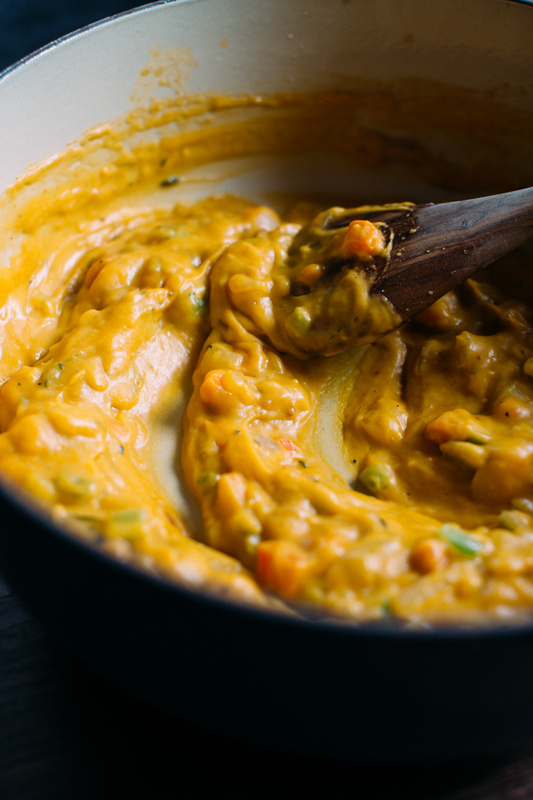 Using a wooden spoon, stir the wet mixture into the dry mixture. Use your hands at the end to help it all come together into a ball. Wrap dough in plastic wrap and set in fridge for one hour while you prepare and roast the vegetables. 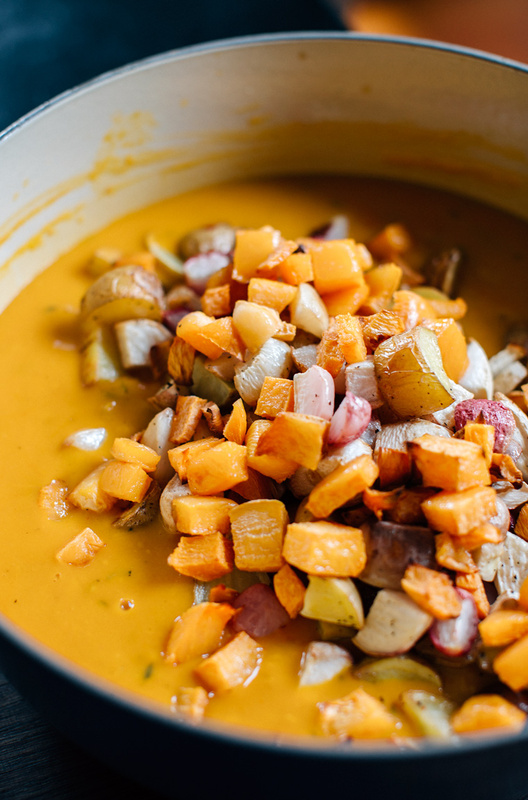 Cut the roasted root vegetables into small cubes (about 1/2 an inch thick). Toss with 2 tablespoons olive oil, sprinkle with salt and roast on baking sheet in oven set to 400F for 20 to 25 minutes (or until you can easily pierce the largest piece with a fork). While the vegetables roast, prepare the filling. 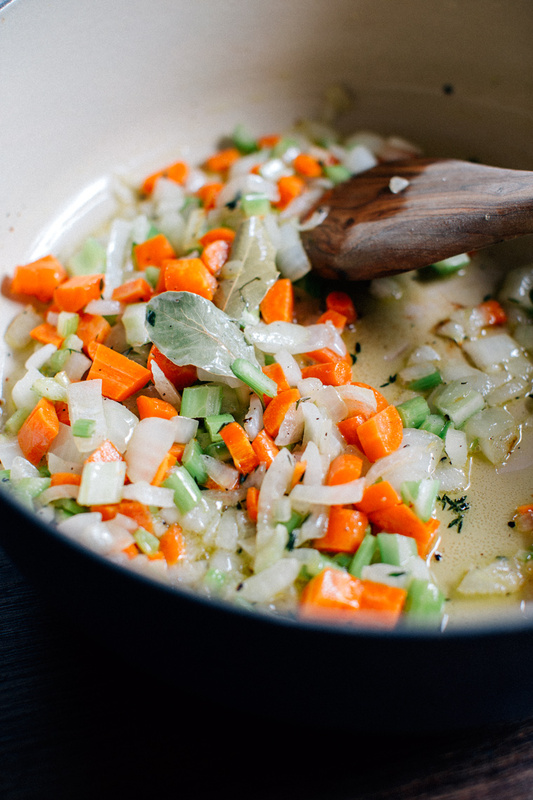 In a large pot set to medium heat melt two tablespoons of butter and add the finely chopped onion, celery, carrots, bay leaves, fresh thyme, salt and pepper. Sauté until onions are translucent, about 5 to 8 minutes. Next, add two tablespoons of flour and stir well. Let this mixture get fragrant and toasty, about 5 more minutes. The flour/butter mixture should turn from white to light brown, with little brown bits starting to stick to the bottom of the pot. Next add the stock, just a little bit at a time, stirring constantly to prevent clumps. After all the liquid has been added, add the minced garlic and turn the heat down. 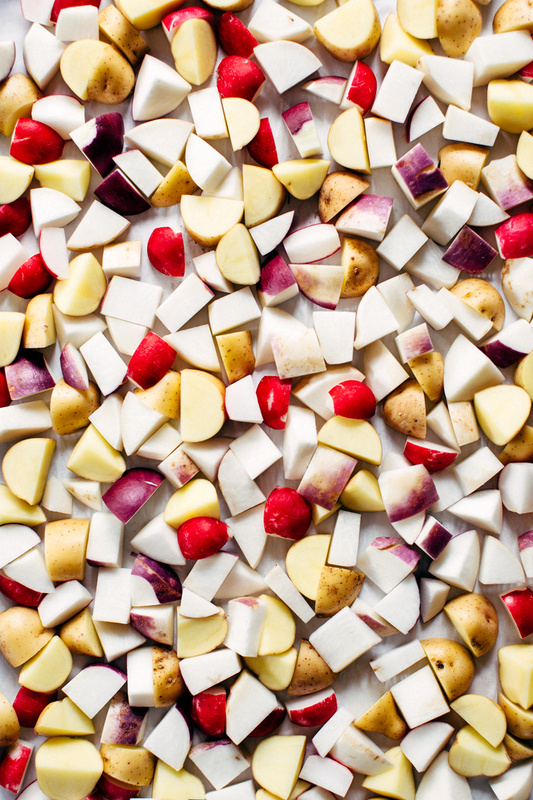 Add the roasted root vegetables to this mixture and taste for salt and pepper. Place the filling in an oven-proof dish. 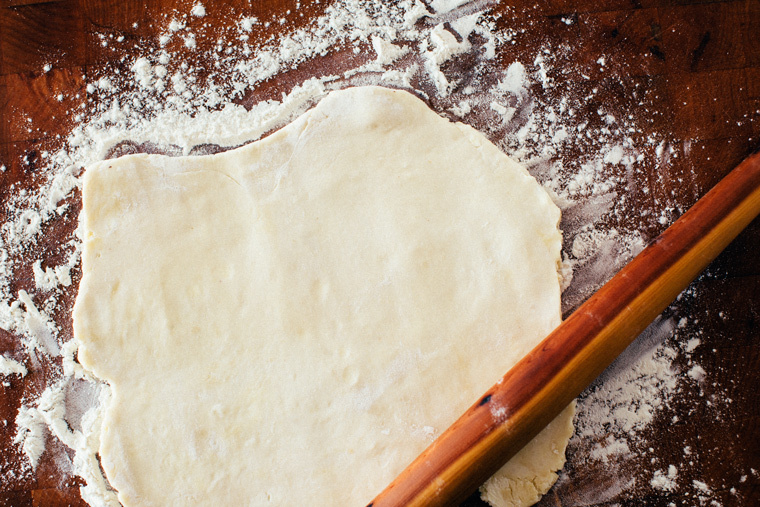 Flour a clean surface and roll out the chilled dough to the size of your baking dish. 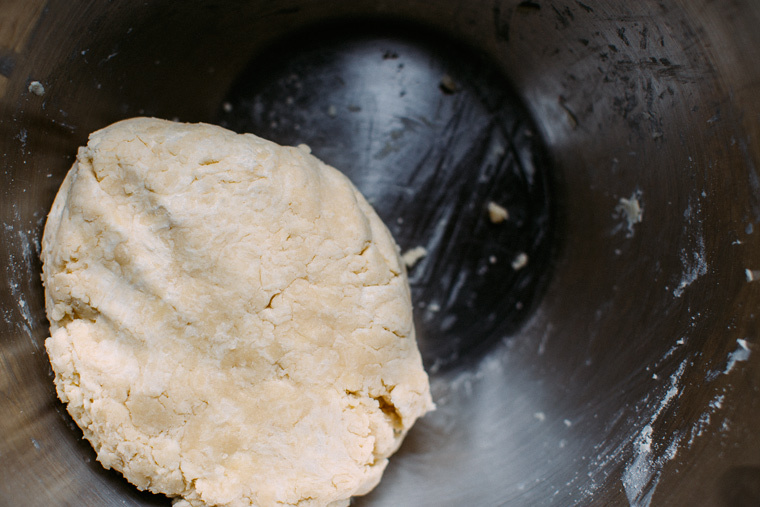 Transfer the sheet of dough to cover the dish (making sure the dough is pressed tightly around the edges), brush with egg wash for egg wash for a shiny crust. Make some decretive slits with a knife for steam to escape. Bake in oven at 375F for 30 to 35 minutes or until crust is golden. I love anything in pastry, anytime of the year but if it’s filled with roasted veg, even better. Can’t wait to try this one. What a cute pup. And you’ve done justice to the vegetable pot pie. 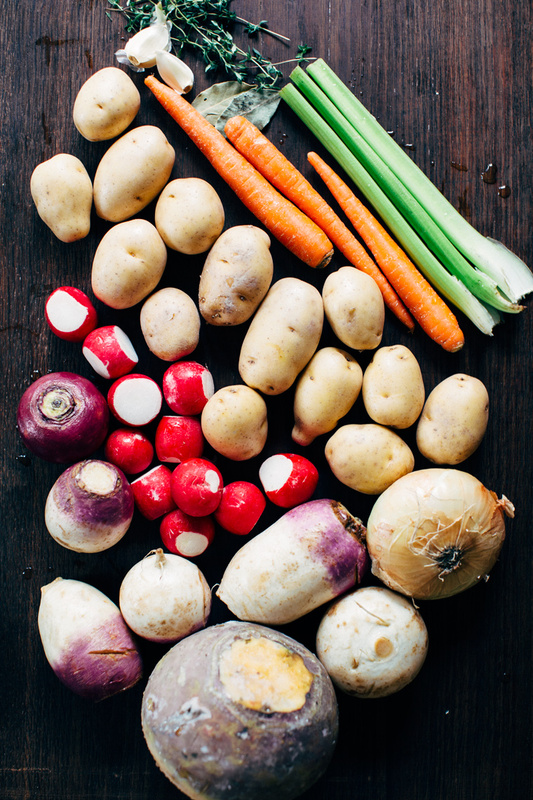 What a great way to use those root vegetables we so often overlook! The crust looks so good too. Stay warm Grace! Looks like real comfort food! perfect on a cold winters day. 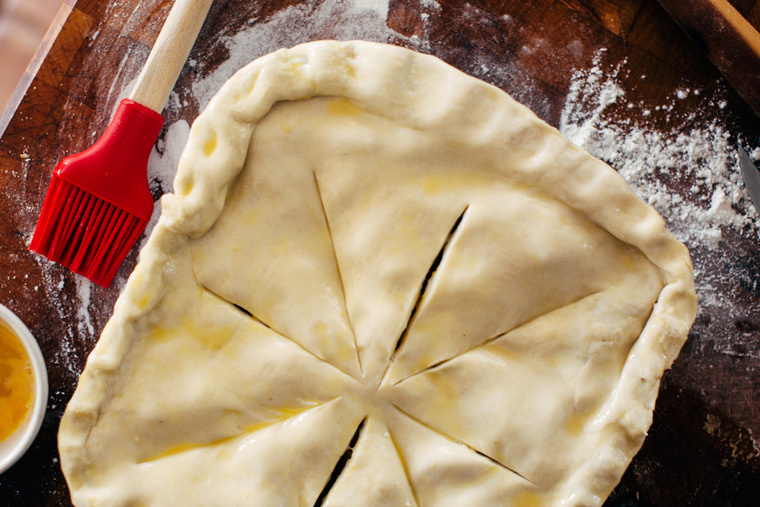 For the butter in the pie crust–is it 6 tablespoons or 1 stick plus 5 tablespoons (that would be 13 tablespoons total)? Thanks! Can’t wait to make this! Hi Alyssa! It’s just 6 tablespoons! I have updated the recipe to show that! Thank you! Thanks so much! 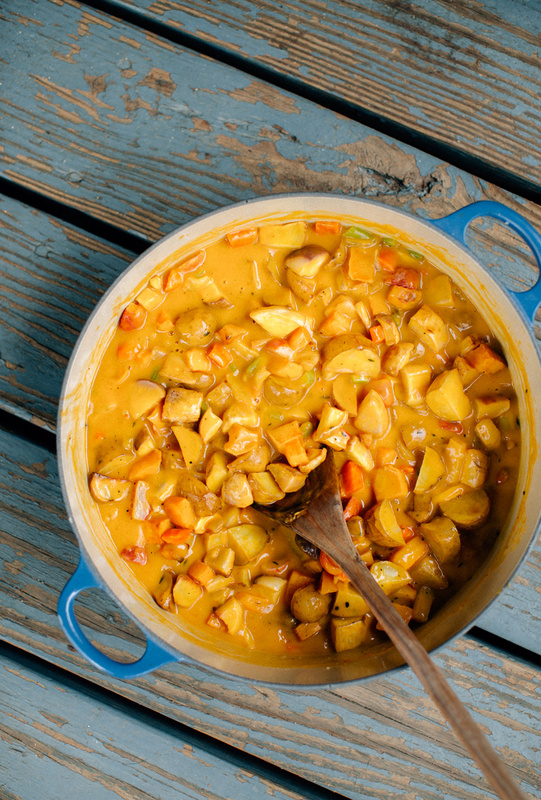 I LOVE your chicken-fry tofu and yellow curry soup so can’t wait to try this tonight! That’s great to hear! You made my day! 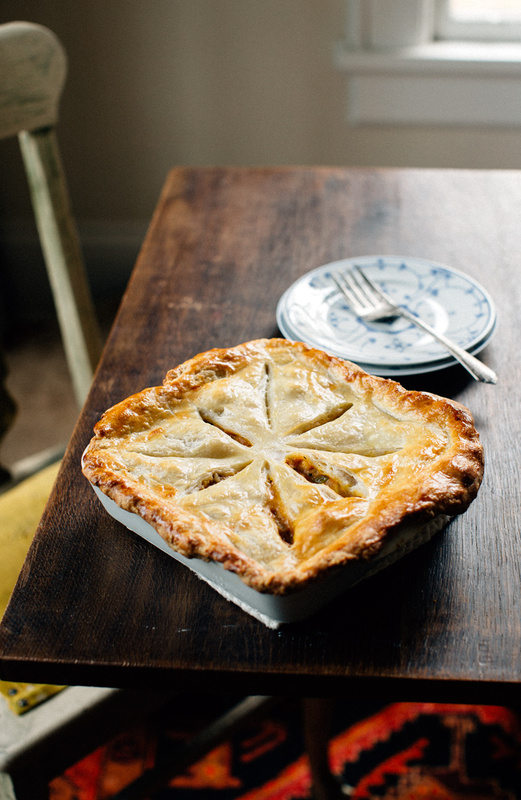 Hope you like this pot pie as much as I did! The recipe for the crust can be easily doubled and it keeps well in the fridge for a few days or in the freezer! Made this last night and it was delicious! Added sweet potatoes and took out rutabaga (didn’t have any on hand). Served 4 with a small serving leftover! 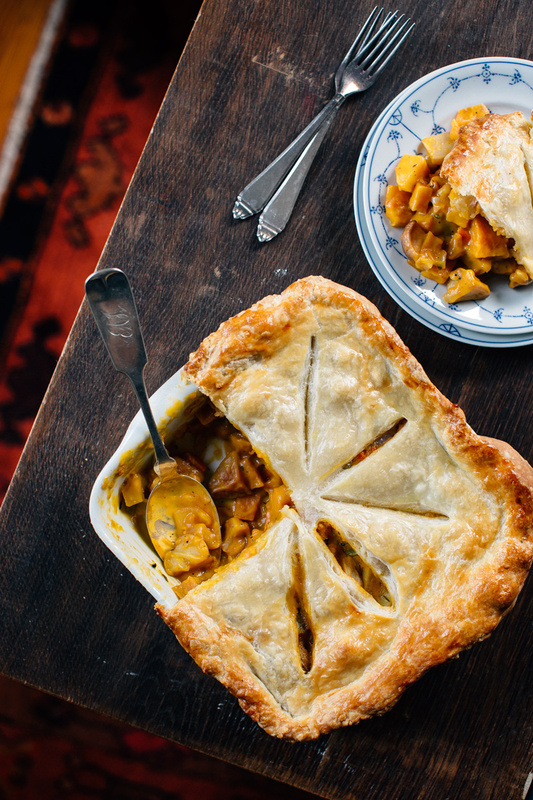 The crust was also easy to make–and I usually don’t like baking. Thanks again! Is this 2.5 cups of vegetable broth? Also, can you double the recipe and double the size of the dish? Yes! it’s 2 and a half cups vegetable broth and you can easily double it! I recommend it! Sorry for my late reply!